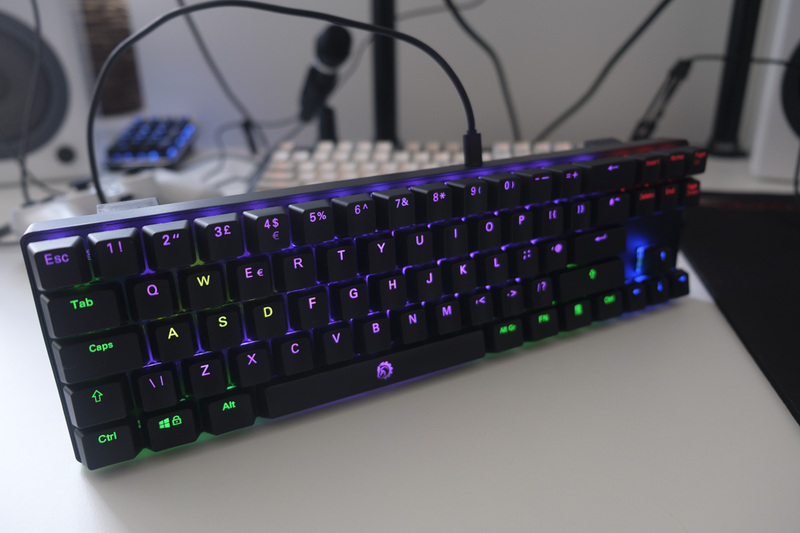 The Drevo Calibur 72, also known as the KeyCool 72, is a compact mechanical keyboard with a couple of interesting features: Bluetooth connectivity and RGB backlighting. The former allows the Calibur to be used with a wide range of devices, from desktops and laptops all the way down to tablets and smartphones, while the latter ensures that the keyboard looks pretty. It’s also quite cheap, costing a little over £50 or $60 as of July 2017. Let’s get into our rapid-fire review. 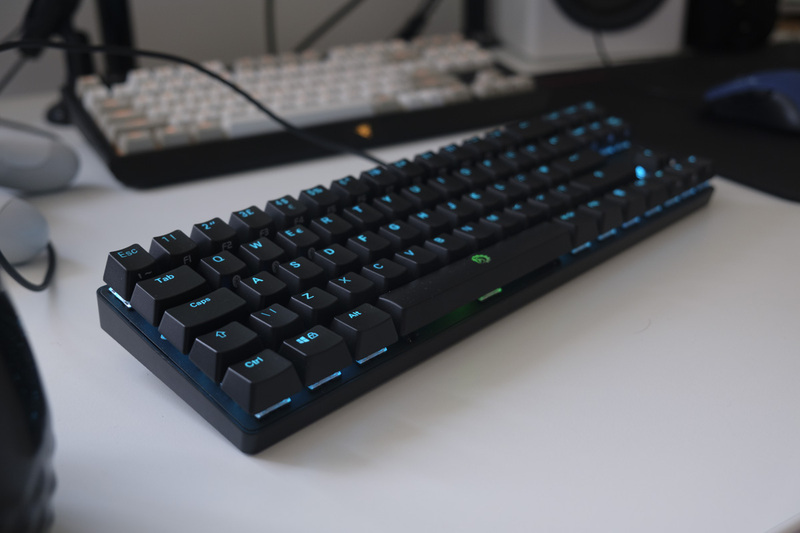 In many respects, the Calibur 72 is a quite ordinary-looking black mechanical keyboard, with its titular seventy-two keys sitting atop a flat chassis with minimal bezels. It is available with a range of switches; our unit came with Kailh Browns. Inside the box, you get the keyboard itself, a Micro USB cable, a key puller and a manual. The layout of the Calibur 72 is interesting, essentially a full-format keyboard with the numpad and F key row removed. That means, unlike many other compact keyboards, the arrow keys and navigation keys (Insert, Delete, Home, End, Pg Up and Pg Dn) are all in their original positions. If you are a typist that commonly uses these buttons, then you will appreciate this layout. However, this also makes the keyboard quite wide, making it harder to pack away into smaller bags and spaces. The F keys are accessed by the function layer, and are quite intuitive: F1 is Fn + 1, F2 is Fn + 2 and so on. 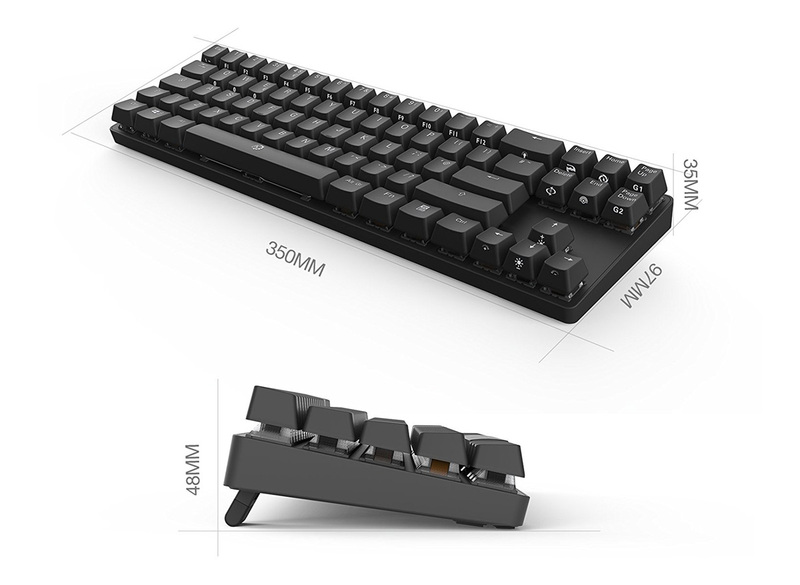 Given the relatively infrequent use of F keys in modern games and workflows, it’s reasonable not to include them on a compact keyboard, thereby keeping size, weight and cost to a minimum. The switches used inside are Drevo-branded Brown switches, legal clones of Cherry’s famous MX Brown switches. Various clones have proven to be quite reliable since their debut, with no widespread quality control concerns of note, and they are available in larger quantities and at a much lower cost than Cherry’s original switches. Brown switches have a small tactile bump, allowing you to know when a key has been pressed, and aren’t quite as loud as some other mechanical keyboards — although they’re certainly louder than the average non-mechanical keyboard, particularly for a smartphone, tablet or laptop! The Calibur is available in US (71 key) and UK (72 key) layouts, although the UK version is not quite ‘ISO’ as claimed by the product page. While it does have the £ key in the correct place for a British user, and the left Shift button is dutifully minute, the Enter button remains in the American style — wide, rather than tall. This isn’t a usability concern, but it is a little bit odd. Also unusual is the apparent lack of the Print Screen, Scroll Lock and Pause Break keys, which makes it rather difficult to take screenshots on Windows machines (although the excellent Greenshot software does allow any shortcut key to be used instead of Print Screen). The keycaps are described as PBT on the back of the box, although they don’t feel quite as solid or high-quality as other PBT keycaps I’ve used in the past. A switch on the back side of the keyboard turns it on in Bluetooth mode; otherwise you can plug in a Micro USB cable to connect it to devices with full-size USB ports. I also received a snapback hat with my order, and you can get one too. According to a card in the box, if you tweet or Instagram your keyboard and get in touch with Drevo, you’ll be sent a hat. Pretty cool, I guess! We used the Calibur 72 with a Galaxy S7 Edge smartphone and a Windows PC, using it as our primary keyboard for a two week period. Here are our impressions. The first thing you’ll want to do when using this keyboard is pair it to your smartphone or tablet, and unfortunately this isn’t immediately intuitive. You have to turn the keyboard on using a switch on the back, then hold Fn + Q, W or E for several seconds. The lights will start flashing, and then you can scan on your Bluetooth-capable device (e.g. smartphone, tablet, laptop). However, once the connection is made, it will be remembered for future use, saving time in the long run. We didn’t experience any connection issues, with the connection remaining stable for the entirety of our testing. The backlighting is controlled entirely on the keyboard, which makes sense if you’re considering its mobile use. However, the iconography used to denote each function isn’t particularly intuitive, and the manual could do a better job of communicating how each mode is controlled. Despite testing dozens of backlit mechanical keyboards over the years, I kept getting stuck in the backlit programming mode when I meant to change the colour or effects. The LEDs used on the Calibur 71 aren’t particularly bright, at least in Bluetooth mode, but they’re more than sufficient for typing with accuracy in dark conditions. Of course, dimmer LEDs will allow battery life to be maximised. 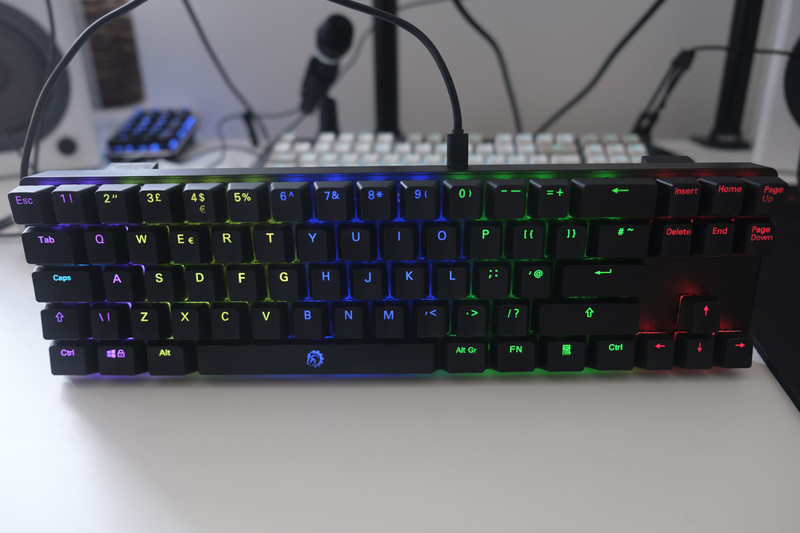 I like having the choice of multiple LED colours, although I do prefer keyboards that allow for custom colours to be chosen in software rather than cycling through a half-dozen options. The Calibur 72 was a perfectly adequate keyboard for typing and gaming, providing good tactile feedback when pressing down each key. In TypeRacer, I recorded speeds of around 100 words per minute, up there with my best attempts on a mechanical keyboard. 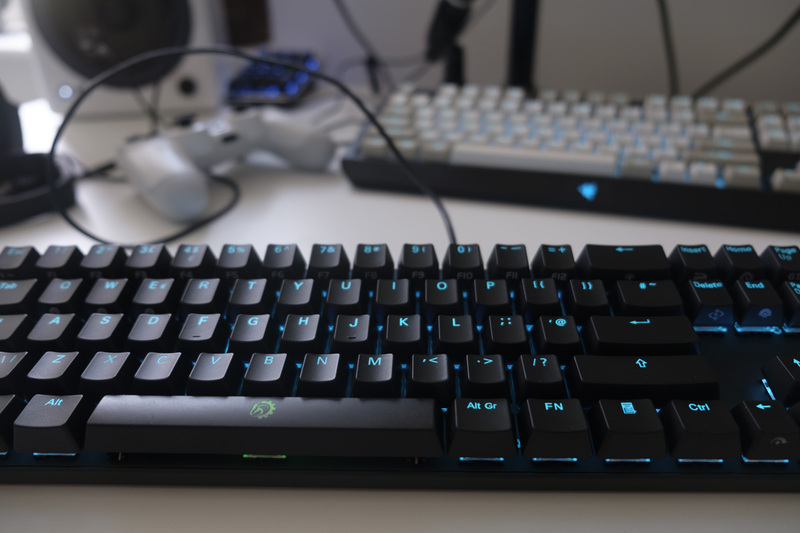 Similarly, playing Dirt 4 or CS:GO went well, with the keyboard offering sufficient rollover for multiple keys to be recognised simultaneously. I did miss having the Function keys in some games (Dirt 4 and Torment: Tides of Numenera for instance) but these were the exception rather than the rule. I did notice a significant amount of ‘ping’ during testing; that is to say, pressing the keys quickly will produce quiet metallic pinging sound. This is not uncommon in mechanical keyboards with plate mounts, although I will say that the Calibur produced a more noticeable ping than other keyboards I have tested. 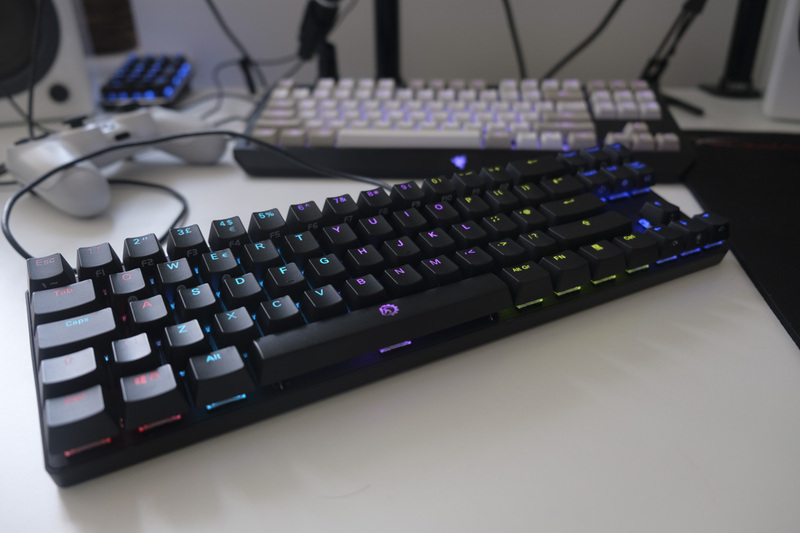 The Calibur 72 proves that you don’t need to spend a lot to get a decent mechanical keyboard these days, even if you’re after formerly high-end features like Bluetooth connectivity and RGB backlighting. 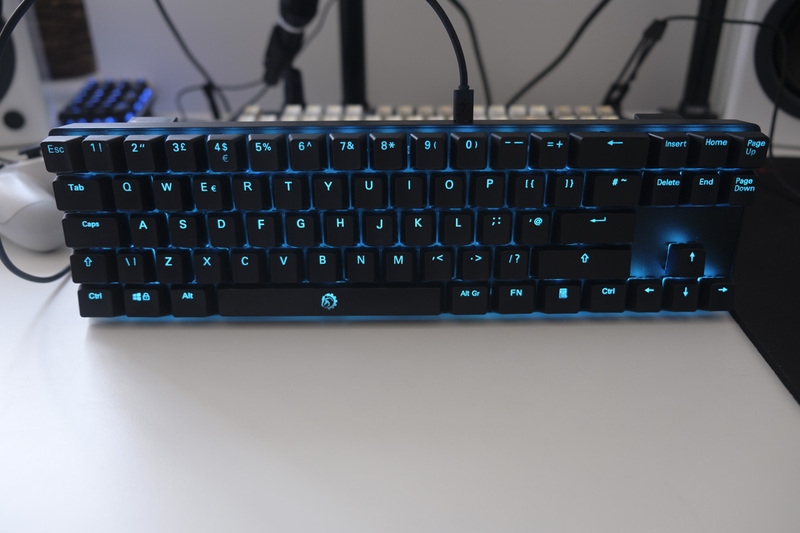 While the build quality and backlighting options aren’t as robust as pricier keyboards from better established brands, the Calibur 72 is still worth considering.